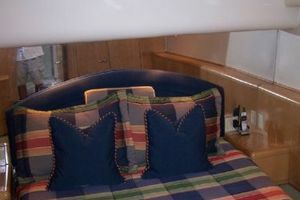 The REEL TIME sleeps a total of 7 in 3 staterooms with the master stateroom to port, a VIP stateroom forward, and the upper and lower guest stateroom to starboard. 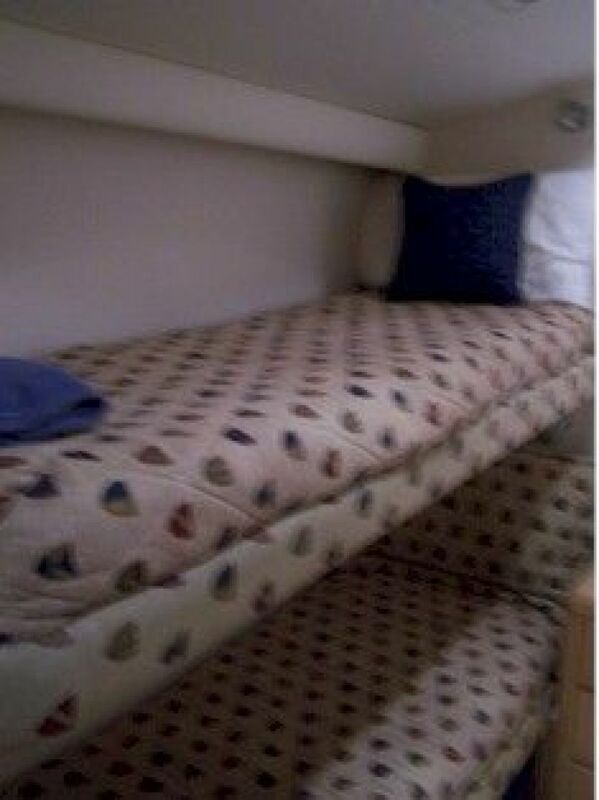 Each stateroom features a private head with separate stall showers with the master having a tub as well. 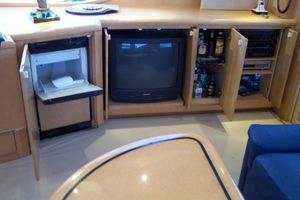 The bow VIP stateroom has a factory custom double berth down and to port with a single berth up and to starboard, a private head, separate shower, 15" Samsung flat panel TV. 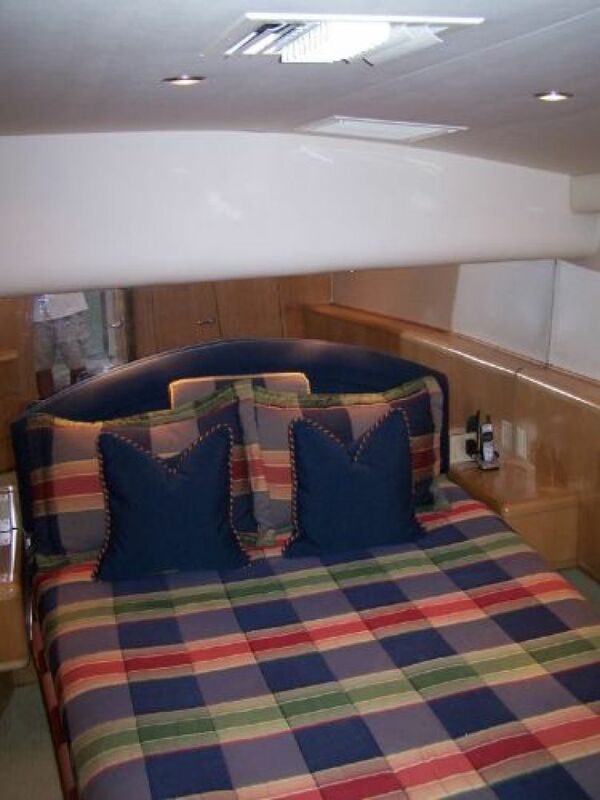 In the master stateroom there is a walk around queen-sized bed to port, a private head with bathtub and shower, and a complete entertainment system. 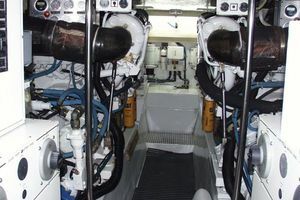 All three heads have mirrored overheads. 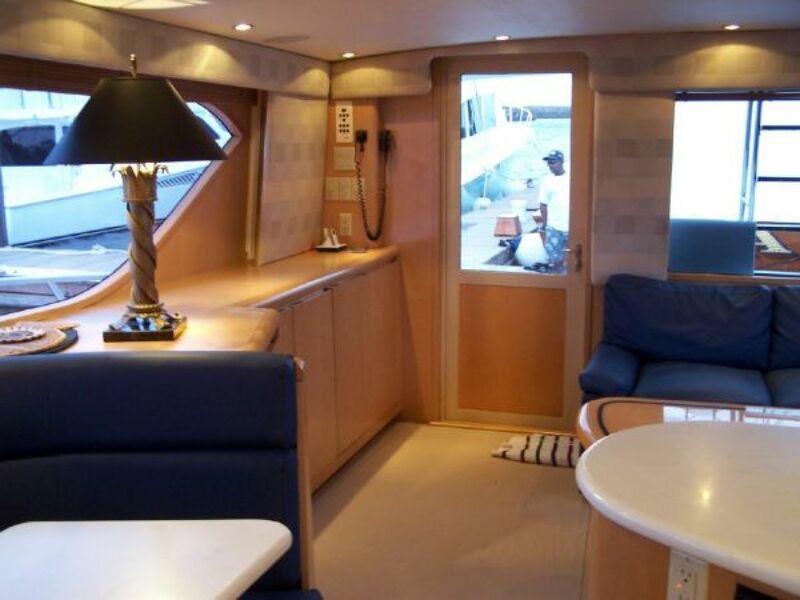 The large salon features the galley forward and to port with an upright side-by-side refrigerator/freezer, white corian counter tops, maple cabinetry, and a manual dumb waiter to the flybridge. 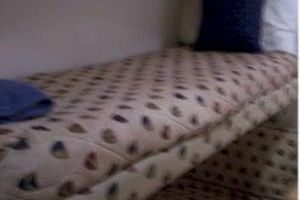 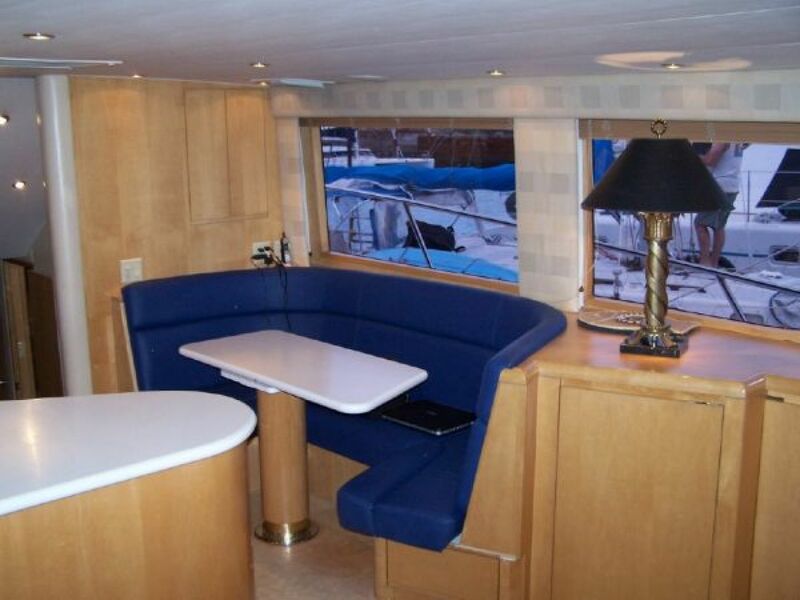 To starboard is the U-shaped dinette. 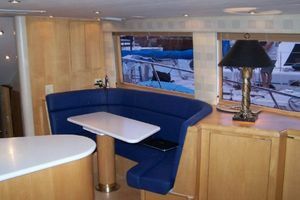 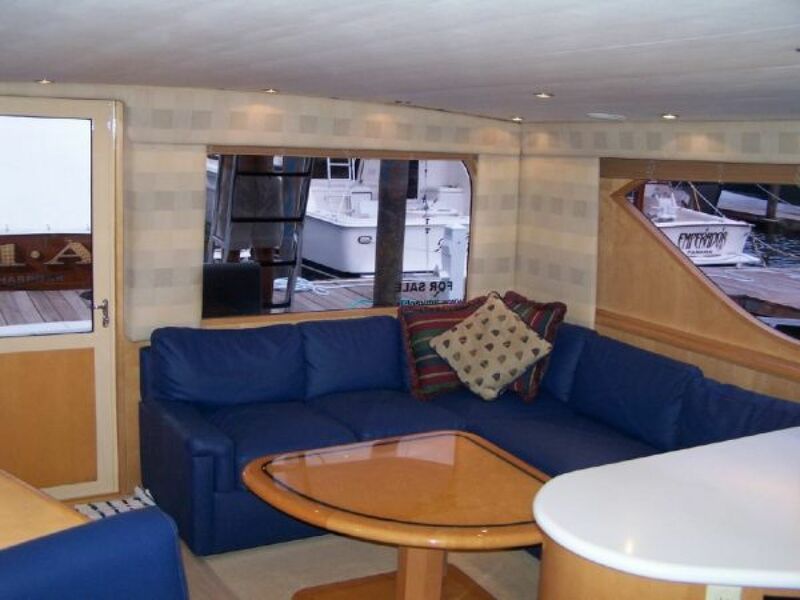 There is a large L-shaped sofa to port and aft of the salon in blue leather with a custom Murray Products table that raises and slides into the sofa for dining. 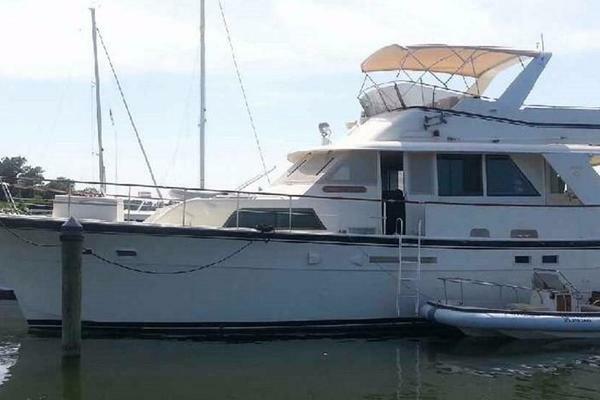 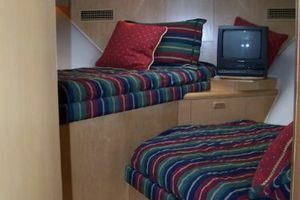 The décor is maple paneling throughout with beige padded walls in the companionway, beige carpet throughout with blue and beige bunk covers, and 1” maple wood window blinds. 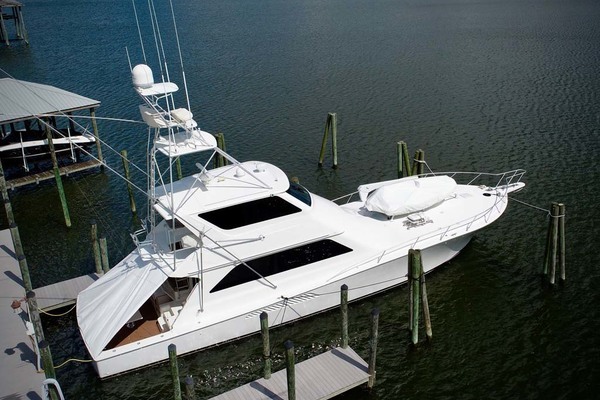 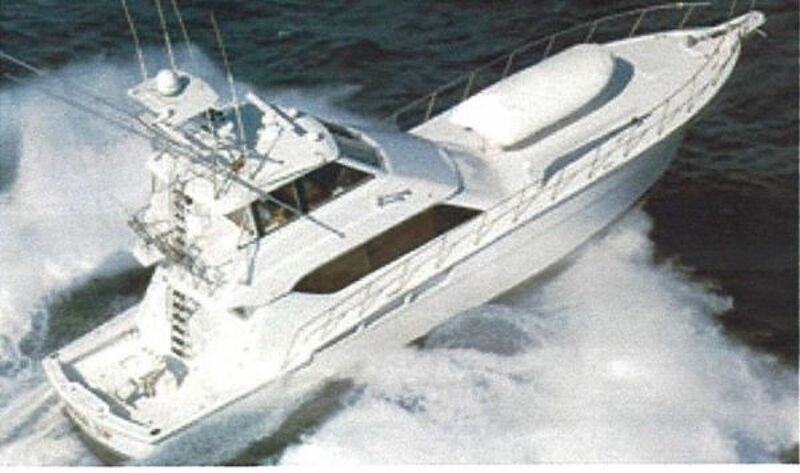 The enclosed air-conditioned flybridge has full instrumentation and built-in electronics, 2 custom bucket style helm chairs and a factory build storage box, tackle storage under the port bench seat, aft deck bench seat, aft flybridge deck control station, and refrigerated drink box. 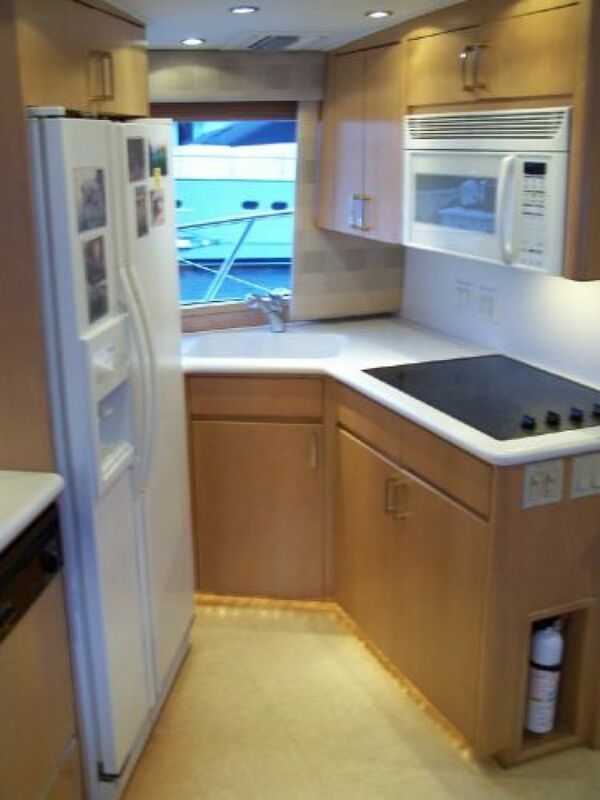 Upright side-by-side Whirlpool refrigerator/freezer with in door ice and water dispenser. 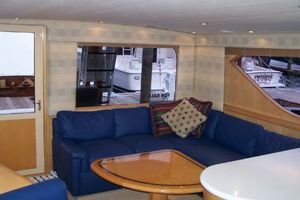 New in 2008. 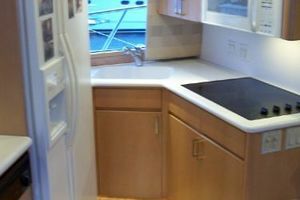 Eskimo ice maker, Bait freezer and Live well. 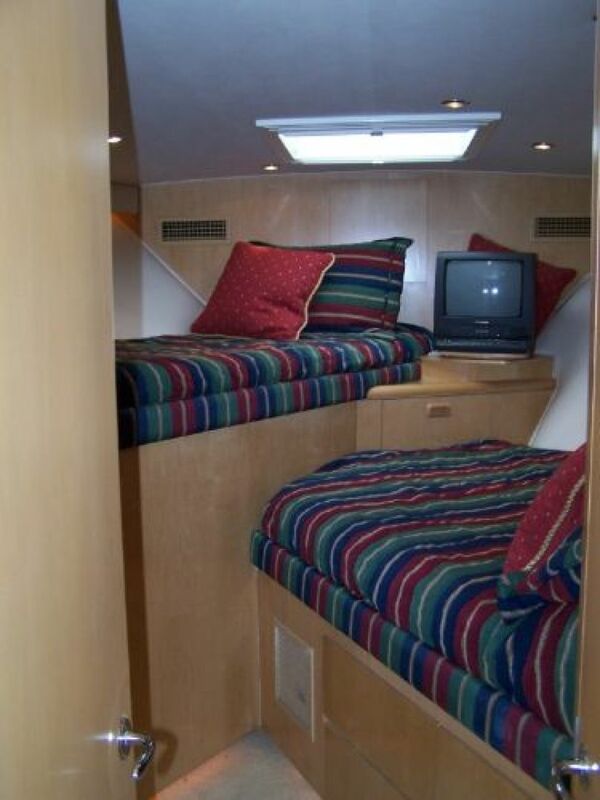 IPOD Dock, Auto Helm digital depth finder. 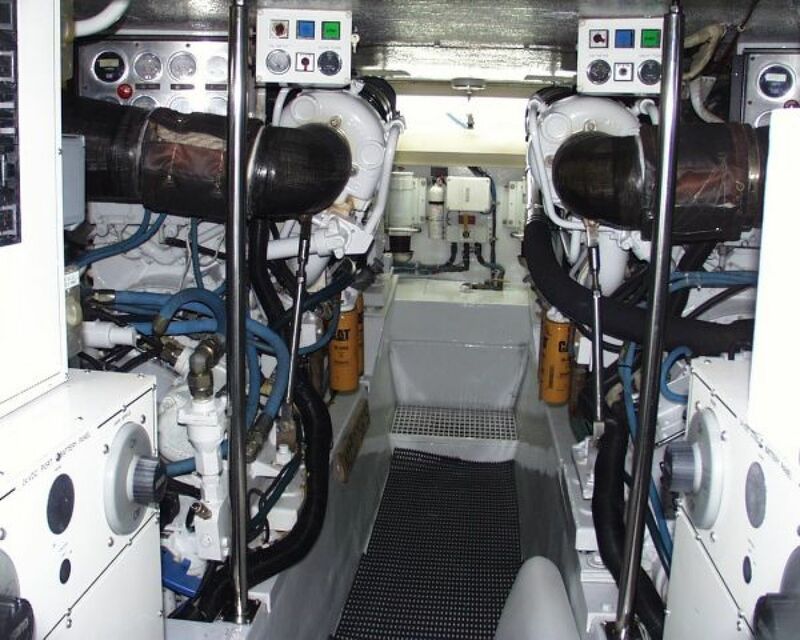 Complete overhaul to starboard engine June 2009. 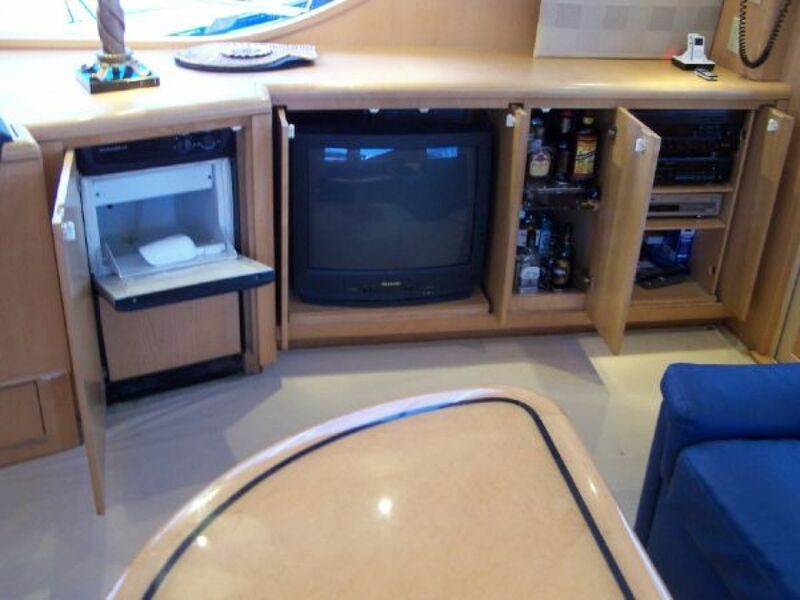 Port Less than 2500 hours. 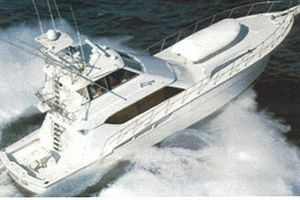 The REEL TIME has enjoyed a successful career of sportfishing. 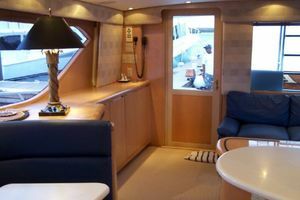 She has nice interior soft goods including a sofa, dinette, and flybridge cushions.This also includes flybridge dash and wall coverings.